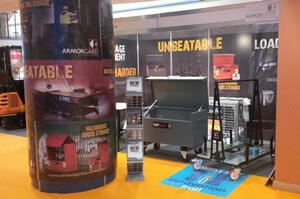 Armorgard recently exhibited at the Executive Hire Show in the Ricoh Arena, Coventry, on 12th and 13th February 2014. Being a show for innovative suppliers to meet with passionate hirers, it was of highest importance for Armorgard to attend. Among the products that we were demonstrating at the show were the LoadAll, TuffBench, TuffBank, OxBox and Gorilla Gas Cage, not to mention the FREE promotional gifts that we were handing out! The Armorgard LoadAll is a brand new product, a folding trolley for storing and transporting plasterboard and other large sheets of materials around site. The LoadAll is folding, stackable, has no detachable parts, and comes complete with a Safe Working Load (SWL) capacity of up to One Tonne. The LoadAll is more than just a plasterboard trolley; it is a unique tool used for stowing and manoeuvring plasterboard and other materials around site. The Armorgard LoadAll was shortlisted on the Innovation Trail at the show. The Innovation Trail is a short list of ten products that are selected as being innovative and of interest to hire companies. Although not the ultimate winner on the Innovation Trail, the LoadAll did generate a lot of positive interest from customers and potential customers. Overall, the Executive Hire Show was a great success for Armorgard, and we look forward to working with tool hire companies all the more throughout the year.